The long dirndl probably is the most traditional version of Bavarian costumes for women. In the olden days, court ladies and maids wore these with a skirt where the length would reach the ankles. 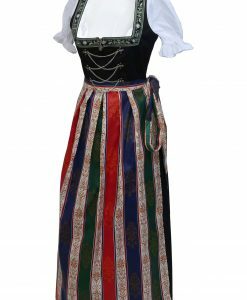 Today, this costume is still a common sight and when you explore our assortment here at Lederhosen Store, you will understand why these beautiful long dirndl dresses are far from old-fashioned. Compared to the mini dirndl or the midi knee-length dirndl, a dirndl with a long skirt remains a more “traditional option,” one that offers a proper style and modern look at the same time. We offer complete arrays of authentic long dirndl dresses that will definitely take your fashion quotient a notch higher and grab the right amount of attention. Designed in the most elegant way, the vibrant selection you find featured here draws inspiration from the classic style women wore for everyday work and life. We take our time to work on the intricacies of the German long dirndl dresses, which makes them an outstanding choice for women attending Oktoberfest. We offer a diverse range of long skirts, in a selection of bright colors. Pair these our Bavarian blouses, aprons, and the dirndl costume. You can also wear these in contrasting colors. Just like the skirt, the apron also comes with a long cut. As the long dirndl does not reach down the feet, so doesn’t the apron. It reaches just above the ankles. This way, the hem doesn’t get dirty when women walk around the grounds. Just like the other variations, you can find these with ribbon style bodice, chains, mieder hook styles, blouses with puffy style sleeves, printed skirts featuring floral embroidery, and several other intricate details. 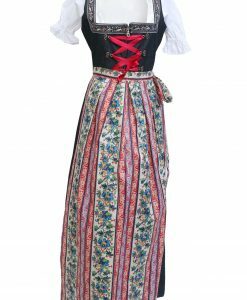 When exploring the lederhosen for sale here for women, do not forget to go through the details of each traditional long dirndl dress we have in store for you. Take your time to discover the best collection of dirndl dresses at Lederhosen Store. Don’t forget to pair your costume with our range of dirndl accessories for women.